(MP215). Alma Claude Burlton Cull (1880-1931). Watercolour signed and dated 1923.. In 1922 consultations were held between the Governors and Cabinets of the Dominions, Colonies and Foreign Protectorates, the Admiralty and the Foreign Office to test the waters on the merits of sending a British naval squadron around the world to cement old friendships. Such a gesture of 'showing the flag’ it was considered, would strengthen the links of the Commonwealth at every level, would open up the way for new friendships with allies and would give the people of the Dominions, Colonies and Protectorates a chance to meet the men and see the ships that had so recently been involved in the Great War. King George V was a keen supporter of the scheme for he believed it would help bind together the Empire and would promote the interests of his beloved Navy: had it been possible he would undoubtedly gone himself we are told! The Special Service Squadron would be composed of HOOD (Captain J K Im Thurn CBE RN), REPULSE (Captain H W Parker CBE RN) and the 1st Light Cruiser Squadron (commanded by Rear Admiral The Hon Sir Hubert Brand KCMG, KCVO, CB): The SSS would depart from the UK in November 1923 and would be away for some eleven months. During the summer of 1923 the firebrand Rear Admiral Cowan’s appointment as Rear Admiral Commanding the Battle Cruiser Squadron (flag in HOOD) ran its course and Rear Admiral Field hoisted his flag aboard the great battle cruiser. Generous summer leave was given, we read, to all the men of the ships who were being assembled for this round the world cruise and in early autumn they started preparations in earnest, for the departure date had been fixed for 27th November. 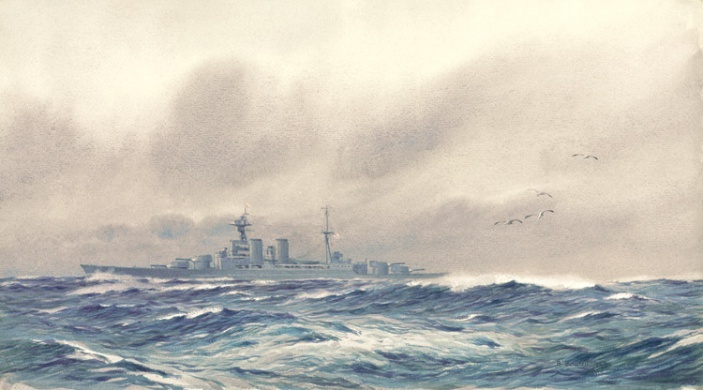 This watercolour by Alma Cull shows HOOD possibly in the weeks before when she was at sea shaking down after time alongside preparing for the long deployment: “Summer 23” is written on the back of the frame which is probably taken from the reverse of the watercolour itself and so it could be either Cowan’s or Field’s flag that the battle cruiser is flying. In recognition of the importance of the Special Service Squadron’s cruise Field was promoted to acting Vice Admiral on 5th November and shortly before the SSS left UK waters the King signalled Admiral Field: “On the eve of your departure on the Empire Cruise I wish you, the officers and ships’ companies of the Squadron, a happy, successful voyage and safe return; my thoughts and good wishes will always be with you”. Famously, the voyage achieved all its aim and more and was rated by the Foreign Office “the most successful exercise in imperial relations in the history of the Empire”. The ships had steamed over 30,000 miles by the time they returned to their home ports on 28th October 1924. Cull was clearly captivated by this beautiful great leviathan, HOOD, for of the few paintings of his that have survived wartime bombing, many feature the battle cruiser. As with all the leading artists of the day he undoubtedly had connections onboard many of the warships he would paint which enabled his brush to capture the magnificent sight they made as they roamed their element out in the open seas. Cull died in 1931 aged only 51: had he lived longer we would undoubtedly have been able to enjoy more of this hugely competent artist’s work. There is room for manoeuvre on some of the prices quoted - do please ask!